The Canadian Women’s Mountain Running team laid down some impressive results today at the 2012 World Mountain Running Championships in Temu, Italy, pulling in some of the strongest women’s results in recent years. This was the first world championships for all four women, so these results are particularly exciting for the future! Stacey Cleveland lead the way, achieving a top 50 result, with Catrin Jones 4 seconds behind her in 51st place. Shannon Penway was close behind in 65th, and Mirabelle Tinio not long behind in 78th place. As in the men’s race, the field was significantly deeper this year than last, with the senior women’s category just slightly less than twice as large as last year’s race in Albania. This also meant that the team competition was a much more competitive affair, and although the Canadians dropped from 12th to 15th, there was an additional 7 teams to contend with. Ultimately the American women won the women’s team competition. The Canadian Men’s Mountain Running team had a mixed day on the trails in Italy at the World Mountain Running Championships. Robert Krar lead the way with a strong 33rd place result in an extremely tight group, where the difference between 26th and 36th place was 30 seconds. National Team veterans Mark Vollmer, Ed McCarthy and Alex Hutchinson and newcomer David Le Porho had consistent performances, finishing right in the middle of the pack, where the race was still so close that mere seconds separated multiple positions. National Champion James Gosselin was unfortunately forced to pull out mid-race due to a back injury. The depth of the field ballooned from 104 at last year’s world championships to 138 this year, so although the Canadians were unable to upstage last year’s 11th place team performance, there were far more teams to contend with. In the junior men’s category, Louis Erik Demers had a tough ask being the lone Canadian in a strong field where team tactics were an integral factor in the race; many athletes finished with 10 seconds of one or two other team members. However, this will be an excellent experience for the Canadian junior, and will be at an advantage over his senior competitors in years to come, having already experienced the sport at the World Championships level. "The Canadian team is excited for the race tomorrow. The wet conditions could play a factor in the race -- it has been raining at Passo del Tonale since the Canadian team arrived on Thursday. The temperature at the finish has been hovering below ten degrees and there was a sprinkling of fresh snow at the top of the course yesterday. The senior men's course includes a difficult and technical descent in the first six kilometres, which will be especially challenging in the wet conditions. The top half of the course includes a short, but steep hill that goes up one a ski slopes. A race report will follow as soon as the results are in. In other news, Ed McCarthy was selected today for random drug testing by the organizers, which has introduced blood testing at the World Mountain Running Championships for the first time." In addition to individual results, there is also a team competition. For men, the top 4 runners and for women the top 3 runners have their placings added together to form the overall team champions. The Italians will be attempting to defend their team championship from last year in both the women's and men's competition. Italy is +1 GMT. For more updates, join the Canadian Mountain Running group on Facebook. The World Mountain Running Championships in Temu, Italy is looking to be a very strong one for the Canadian Mountain Running Team, and is also one of the largest in recent years. The men�s team is being led by several extremely experienced and accomplished trail runners. Experienced Canadian Mountain Running team veterans Alex Hutchinson, Ed McCarthy, James Gosselin and Mark Vollmer have, between them, a combined thirteen years of international running championships in mountain running and cross country, and several experienced the most recent all-uphill World Championships in Kamnik, Slovenia in 2010. The Men�s Team newcomers have their own international running pedigree, and include Robert Krar, winner of the 2012 La Sportiva Mountain Cup Series and previous winner of the TransRockies Run in Colorado, USA, and David Le Porho, who, in addition to dominating much of the trail running scene in Quebec and the east coast of the USA, is a internationally accomplished snowshoe runner in the winter, most recently winning the World Snowshoe Invitational in Japan. The women�s team is equally exciting, as this will be the first World Mountain Running Championships for all of them. The team is formed of several highly successful athletes at the National level, now heading onto the world stage. They include Mirabelle Tinio, multi-time overall winner of the BC 5 Peaks Trail Running Series, Shannon Penway, member of the winning team in the Arc'teryx Squamish 50 Miler, and Catrin Jones, a medalist in multiple international marathons including Bergamo, Italy, Lausanne, Switzerland, and the winner of the Tour de Pays de Vaud XC race series in Switzerland. The team is rounded out by Stacey Cleveland, who in addition to the Mountain Running Team, has already booked her place at the 2013 Ultra Trail Championships in Wales. They will all be looking to tangle with the best in the world and continue to threaten in years to come. The Canadian Mountain Running Team is also very excited to have Louis Erik Demers rounding out the team as the sole junior. An experienced track and cross-country runner, Louis booked his spot on the team by winning the Canadian Mountain Running Championships on Cypress Mountain in Vancouver. 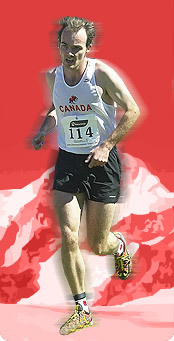 The team is lead by Adrian Lambert, who holds the best ever result for a Canadian Mountain Runner, placing 21st in Switzerland in 2007. He will be sending a preview of the race and the course before Sunday, September 2nd, as well as providing a report and analysis post race. For all the updates, join the Canadian Mountain Running group on Facebook.